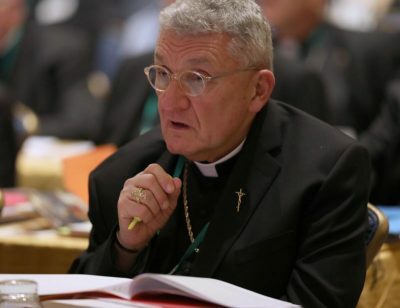 Bishop David A. Zubik of Pittsburgh looks over documents on sexual abuse for discussion Nov. 13 at the fall general assembly of the U.S. Conference of Catholic Bishops in Baltimore. (CNS photo/Bob Roller) . PITTSBURGH (CNS) — Bishop David A. Zubik has introduced the independent experts who will run the Diocese of Pittsburgh’s new compensation program for survivors of clergy sexual abuse. During a news conference Dec. 13 at the diocesan Pastoral Center in downtown Pittsburgh, the bishop announced the creation of the independent reconciliation and compensation program that will be administered by Kenneth Feinberg and Camille Biros, who are working on similar programs in the dioceses of New York and New Jersey and other areas of Pennsylvania. Their task will be to invite abuse survivors to accept the terms of the program so they can receive money as soon as possible. Feinberg is well known for his administration of compensation programs for victims of 9/11, terrorist attacks, the movie theater shooting in Aurora, Colorado, and the BP Deepwater Horizon oil spill. Feinberg said the program will cover cases of abuse by clergy of the Diocese of Pittsburgh that happened previously and were reported, and those cases that have never been reported. Claims of abuse by lay employees or clergy associated with a religious order will not be covered under the program, he said. Biros said the program will begin with the diocesan victim assistance coordinator sending a letter to all known victims to invite them to participate in the program. Then compensation could be issued as quickly as 90 days, she said. The keys to this type of compensation program, Feinberg said, are speed in issuing a claim, efficiency and certainty that the claim will be validated and compensated. Anyone who chooses to accept the financial offer as part of the program waives their right to future litigation, Biros explained. But the agreement doesn’t bar the claimant from disclosing details of their claim, she said. But he added that the program is about more than just money. “It is about recognizing the harm done by past abuse and of our continuing the pledge of taking every appropriate action to prevent the occurrence of future abuse. We believe that it is important for us to help survivors resolve their claims quickly,” the bishop said. At the beginning of his statement, Bishop Zubik reviewed the efforts undertaken to address the clergy abuse crisis, such as the recent series of four listening sessions that he attended and the hiring of Shay Bilchik of Georgetown University to examine diocesan practices related to the protection of children and young people. “I have promised to take what I have heard in these sessions, as well as the recommendations of Professor Bilchik, and present them in substantive plans of action that will be released in the form of a pastoral letter before March 6, the beginning of our Lenten season,” he said. Cone is editor of the Pittsburgh Catholic, newspaper of the Diocese of Pittsburgh.